Note to PepsiCo: no one in the prized 18-25 demographic is going to change their MySpace profile name to “mtn dew me”, no matter how cheeky the new name is intended to be. "Mountain Dew Me"? has anyone ever used that as a MySpace profile name? hmmm. A few months ago, I saw a T-shirt in a novelty store that said "Mount and do me," parodying the then-current Mountain Dew logo. On my last shopping trip I noticed a new packaging for Diet Mountain Dew, indeed for all Mountain Dew, using what appeared to be "LEET" speak for the product name, specifically "MTN DEW." I had to move several boxes of this newly branded product to find "Mountain Dew" without this idiotic spelling. Needless to say, I am most unhappy with this new branding and will be avoiding the purchase of it. I quite understand that it is the same product, but I'm not sure I can bring myself to purchase something that I consider to promote illiteracy as does this new brand. Some might have abbrievated Mountain Dew while sending text messages in the past (if anyone actually texted something about the drink), but is that really a reason to abbreviate the name on the label? And should someone stop buying the stuff because he's annoyed by the new logo? If he likes drinking the stuff, then why let a new logo stop him from buying it? I think that's plain silly. BTW, I only rarely drink Mtn Dew (hey, just writing it the way they're writing it now!) and I absolutely hate Pepsi. And this man might just find some remaining stock of Mountain Dew in the old packaging. I'm still finding Coke and Diet Coke in the 2008 Holiday-themed cans. I believe I found one in the vending machine at work sometime last week, I saw a co-worker drinking a Coke can in the holiday can. This morning I woke up to an earthquake while asleep and discovered the electricity had gone out. I had to reset my alarm. It was just past midnight. There had been an earthquake earlier this week sometime after 10PM that had also awoken me than. An aftershock followed later. I came home from work and found no mail in the box. I just assumed I got no mail today. But little did I know that that the mail had not yet arrived. Yesterday I'd gotten a movie from Netflix which I did not get around to watching then, so I did do today. I finished watching the movie just before 4PM and heard a car pass in front of the house. Only it wasn't a car, it was the mail truck. Wow, that was bad timing! I have to wait tomorrow to mail the movie, but that's all right, since I can keep them as along as I want. I am still upset about not having done anything for my birthday almost two weeks ago. Anything but going to some movie or restaurant. Different quizzes can often have different results. Once again, I got ENVY. Facebook or MySpace? How about other social networking sites? I came across this question on Yahoo Answers. Really, I don't prefer one over the other, I just happened to have been on Facebook longer. I'm still getting used to the page format of MySpace. Read my earlier entries on these subjects. I'm now wondering who uses other social networking sites. If anyone uses other sites, how are these? Does it seem redundant being on more than one social networking site? One I've been curious about is Bebo-- anyone use that one? How about this--have you heard of that one? How about Xanga--anyone on that? I just got one of these last weekend and can't wait to use it. I've got the Kodak Easy Share, 8.2 megapixels. I'm wishing for an occasion for which picture-taking will be a must. I wish I were going to have that party (see my Party Envy Blog). This would make a great set of photos to share on my Facebook or MySpace pages. It's what the people on the sites want to see. This is what most of the others put on their pages. I just don't want some random thing like buildings or sunsets. No one wants to see those. This, IMHO, is akin to first-grade show-and-tell, when a kid brings in a leaf he picked up off the ground on the way to school and gets mocked by the rest of the kids who don't care about some random leaf. Or akin to someone who envies the others for having a popular toy for show and tell. I also want to be able to tag people in photos on my Facebook page. Most of them I don't see in person very often, but I do have some co-workers and family members among my friends on Facebook. Users can also tag themselves in photos. In recent years, I only took pictures once in a while, particularly on Halloween. I would get one-time use cameras. Since getting onto Facebook last summer, I've only added three albums, transferred from a picture CD I got when developing the film, and my profile picture (my former boss took this with his camera phone). I got prints of the pictures I took last Halloween, but also got a CD with the pictures. The next two times I took pictures with disposable cameras, I requested only the CD, worrying the prints would just be sitting around in the envelopes. I'm also curious abut the various photo-sharing sites, such as Picasaweb or Flickr. What other photo-sharing sites are there? Which do you prefer? In my last post, I said how I rarely drink Mountain Dew, now printing its name as Mtn Dew, something I just saw today. 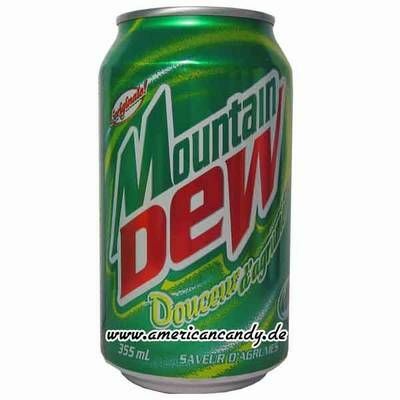 I was surprised when I learned that "mountain dew" is actually a euphemism for illegally distilled corn whisky or moonshine. There's even a song about that. Really, they were able to use this as soda name? Obviously so, and customers were apparently OK with the name. Sadly, the genius who completed the page of Dr Pepper clones had no interest in doing the same for Mountain Dew. Too bad, since he would have plenty of Mtn. Dew clones for such a collection. While searching for lists and pictures of Mountain Dew knockoffs, one thing I found was this blog on off-brand sodas, including both Dr Pepper and Mountain Dew clones. About the best list I could find of clones is this one. I also came across this blog. Though I'm not a big drinker of Mountain Dew, I have on occasion had some of the stuff or one of the knockoffs. In my Dr Pepper clones post I mentioned the Kmart (American Fare) knockoff Citrus Mountain. I purchased both sodas a few times toward the end of 2001. Notice how the name Citrus Mountain makes reference not only to Mountain but also to the citrus flavoring of the sods it is cloning. Almost all Mountain Dew clones have "Mountain" in the name or some related word, such as alpine, followed by words referring to precipitation, such as mist or lightning. Mountain Lion: Sounds more like a beer name, IMHO. I've never seen this one, since it's from the Food Lion grocery store chain which only exists on the East Coast. Sun Drop: This has actually been around since 1949 and another I've never been able to try since it's sold primarily in the South. Though it can be ordered over the Internet. Citrus Drop: sold at Kroger, a Southern grocery chain. I have actually seen and bought this one at my local Quik Stop Market since Quik Stop is owned by Krogers. The name seems like a reference to the aforementioned Sun Drop. Citrus Drop's slogsn "Pop the Drop" is a likely reference to Mtn. Dew's former slogan, "Do the Dew." Heee Haw (Hyvee) and Kountry Mist (Winn-Dixie): No surprise that these come from two other Southern grocery chains, Needless to say, I've never seen these either. Spring Mist (IGA): The IGA exists in California, but taking a look at their store locator, the nearest ones were between 69 and 101 miles from my zip code. I seriously doubt Ill ever go out of my way just to find one of these stores. Moon Mist (Shasta): I actually found some of this once, but was unaware it was a Mtn. Dew clone until I saw it contains caffeine. I have never seen ti for sale since. Mountain Roar (Harris Teeter): yet another East-Coast grocery chain. Kind of, like Mountain Lion, sounds more like a beer name, IMHO. Mountain Lightning (Walmart): This used to be called Green Lightning. Despite having a Walmart near me, I have never bought this soda. This is another subject that I cold go on and on about, like my previous post. But this should give you the basic idea. I apologize that I could only find a few pictures of Mountain Dew ripoffs. It's about time I told readers about something I've had a fascination with for a long time now: the name Bob. I honestly don't know how this began, but somehow it did. I just like the name Bob. 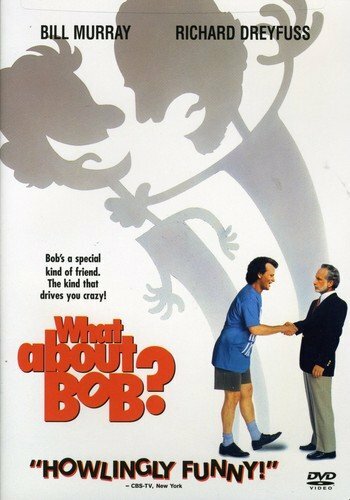 It may have started with the hit movie What About Bob? I saw that movie when it first came out in the theaters, and a few times when it was shown on TV. I eventually got it on DVD for only $5.50 at Target. How do I even begin to tell those I don't know who are reading this what I have done using the name Bob? It's complicated. I've tried using the name Bob as a conversational filler, much the way some of us in California use of the phrase "dude". Of course, it's only my doing (as far as I know!) and some aren't likely to catch onto it. My mom's been OK with it, but my late aunt (God rest her soul) tended to get a little annoyed by it. Often, if someone asked me something, I'd reply. "Yeah, Bob." My aunt often said, "My name is not Bob." I'd also use it in a greeting, "Hi, Bob." My aunt at this would also say, "My name is Not Bob." A family friends reacted the same way when I used these phrases while talking to her. My saying "Hi, Bob" sounded a little like the greeting used on Bob Newhart's 1970s sitcom. I have often thought Bob would be a good cat name. Though I'm not sure what kind of cat it should go with. What do you think? Around 2001, I began noticing generic products in grocery stores including generic brands of sodas. All store-brand soda lines seem to contain knockoffs of Dr Pepper and of Mountain Dew, with their own names. I'll be writing about this in another blog so that I can get right to how this ties into my subject of "Bob." 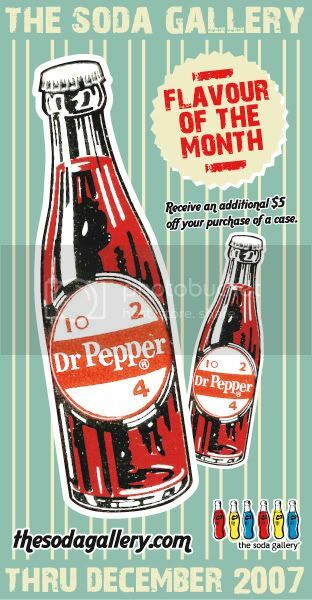 I once joked about using "Bob" as the name of a soda line, asking a family friend via e-mail how did Dr. Bob sound. He said it sounds kind cool. Imagine my surprise when I discovered there is actually a soda called Dr. Bob. Sadly, I've never been able to find this, though I have never actually looked for it. I'm under the assumption that it's not available anywhere in California. Anyone know opposite of that? I then asked "How does Mountain Bob sound?" He replied, "Sounds more like some big hairy guy's name." Everyone I asked thereafter seemed to agree with that remark. My former boss remarked that "Mountain Dew is one thing," and that he can't imagine someone saying "I'm going to get a six-pack of Mountain Bob." There used to be a fast-food restaurant in my hometown called Bob's Drive-In. It's been gone since the early '90s. No doubt many of you have heard of the Bob's Big Boy restaurant chain. I have never actually even seen one of these, let alone that I've never been to one. I liked the idea of a pizza place called Bob's Pizza. while Googling that phrase I came across this in Detroit. In all likelihood, I'll never get to go to this place, since I live who knows how far form Detroit. But it was fun to find this. Bob Hope, Bob Dylan, Bob Newhart, Bob Crane, Bob Cummings, Bob Denver, Bob Dole, Bob Hoskins, Bob Keeshan, Bob Fosse, Bob Elliott, Bob Cratchitt, Bob and Carol and Ted and Alice, Bob Mackie, Bob McKenzie, Bob Roberts, Bob's Bog Boy, Twin Peaks Bob, Bob Seger, Bob Sarlatte, Bob Marley, Bob Saget, Bob Weir, Bob Smith, Bob Packwood, Buffalo Bob Smith, Bob Ross, The Bobs, Bob Geldof, Bob Barker, Bob Eubanks, Bob Keeshan, Bob Welch, Bob Vila, Bob the Builder, SpongeBob Squarepants... Gee, could I have missed any? If you don't recognize some of these names, look them up yourself, please! And I thought this was funny. This of course refers to the hairstyle known as the bob, but the phrasing made it sound like Bob Green was the name of a character or something. And "bob" is also a verb. This is the basic idea of my fascination with the name Bob. It's a bit too complicated to completely delineate. But I hope you get some ideas about this unusual fascination.. Do any of you have as unusual a fascination as this? Finally, after trying several times, I was able to create a MySpace account. I could never get the text captcha needed to be typed in order to complete my regisitration. I blame that on not having an updated browser until a few weeks ago. Now I'm looking for friends on MySpace. I already have several on my Facebook page. I've been a member of Netflix since 2007 and have enjoyed being able to rent movies without having to go back and forth to a video store. As a member I've been able to watch a lot of movies I missed when they first came out. Too many to name! I've also found movies that some people I know have never heard of. My now-ex-boss was unfamiliar with Buffalo 66 with I had heard about somewhere, somehow. I'm just sure where or how, but I was interested enough to add it to my queue. He also seemed unaware of the classic Cooley High, the 1975 film that served as the basis for the sitcom What's Happening!! If you liked that show and have never seen the movie, you definitely should rent Cooley High. And has anyone seen Friends With Money? And I discovered two Will Ferrell flicks that some of you may not be familiar with. Not two of the best I've seen, but worth checking out if you want something different and out of the ordinary. When I first signed on, I got quite greedy, finding a lot of movies I never saw the first time (as I said earlier), finding ones I saw in the past but had a desire to see once again. I've--since the beginning--been rearranging the order in the queue pushing some back and some to the top--those I was more eager to see at the moment. As a result of this, some have seemingly been in the queue forever. I can remember when some were still in lower positions in the queue. It seemed it would be like forever till I saw the ones the were in the lower-numbered positions, and then it seemed like they suddenly reached the top spot. The above-mentioned Friends With Money and Buffalo 66 were two such flicks, along with too many others to mention. Today at work we began receiving Christmas And St. Patrick's items. And it's only early January. Valentine's Day hasn't even happened yet, and now these other holiday items are starting to arrive. I'm guessing this is true at other retail stores. I was at the Dollar Tree (where I once worked) while off yesterday and saw Easter and St. Pat's items there along with Valentine's. That got me wondering when Home Goods was going to get these holiday items. Sure enough many came in today, including signs with St. Patrick's logos and shamrocks. For Easter there were boxes of wooden Easter Eggs, rabbit figures and tubes of plastic eggs. There were also dinner wear items with St. Pat's and Easter designs. The linens with these designs should be too far behind. I'm not sure what holiday merchandise will arrive, as it seems to too early to be sending in the July 4th stuff in either February or March. April, at least will be three months ahead. Not a lot of items under the seasonal department number (47) came in last year, mostly kitchenware and linens. About the only Department 47 items we received for this holiday then were little mice (we get these for almost every holiday) in read, white and blue clothing, toting around mini USA flags. And believe it or not, Halloween merchandise arrives as early as Memorial Day or later--up to five months ahead of time! And--need I say it-- as soon as Halloween nears, in comes the Christmas stuff. I have yet to see other stores such as Wal-Mart, Target or Rite Aid, but I expect that next time I get to one of those I expect to see what's left of Valentines and to see some Easter and St. Patrick's (if they have things for that one). 10. Stop the soil=2 0from leaking out of a plant pot. Line a plant pot with a coffee filter to prevent the soil from going through the drainage holes. Really? Can all this be true? I only wonder. I'm not a coffee drinker, so I don't feel compelled to buy coffee filters. Sometimes I feel compelled to try ideas like these that many people (including myself) may have never known. A few years ago, I bought a book called The Hippie Handbook, which advised using baking soda as a cleaner. I din;t completely go hippie, but did try using baking soda to clean the inside of my microwave. Sounded like a good idea, because baking soda will not leave chemicals in the microwave. You don't see them, but they're there. The chemicals can get into your food. A lot of you have probably not thought of all this. Try using baking soda to clean out your microwave or at least using a wet cloth to avoid leaving chemicals in the microwave. About the coffee filter ideas presented here, I'm not sure if I will be trying any of them. I don't do some the things presented and I have never known to cover bowls in the microwave. I guess I've learned something here. Have any of you ever gotten to have one of these parties? If so what was it for, specifically was it for something other than someone's birthday? I'm told people have parties for no real reason. I don't know about some of you, but I think that idea is stupid and a waste of time. I think there needs to be a reason for it. Who thinks otherwise? One year I came across a group of people at the Salvation Army store in Seaside (a week before Christmas in 2004, to be exact) who told the man at the store that they were going to an 80's party. I asked if it was for someone's birthday but they said no. This was right after I came across the idea to celebrate your birthday like a hippie from this book (I was a hippie on Halloween 2004). I liked that idea, but there was no time to plan it. That's the problem with having a birthday in January. it certainly looks like I won't be doing anything on Sunday... No time and not enough money to plan or have one in the aftermath of the holidays in December. It certainly looks like I won't be doing anything on Sunday... Not even going to a restaurant, which I'm getting tired of doing. If you ever worked in retail, you know what it's like to have to do inventory every year. I've worked on retail for over seven years now and at my current place of work, this coming Friday is inventory day. We've been precounting merchandise in the boxes in the warehouse. I've always dreaded this day, and at my current place of work, Home Goods, inventory always seems to be right before my birthday (January 11). The store has looked slightly empty, since we have not received any new merchandise by truck and will not get another delivery until next week, when inventory is over. One of my former places of work, Dollar Tree, had inventory at different times each year. The first year I worked there (they opened the store in my town in Sept. 2001) I believe inventory was in June (2002), then in May the following, in August the next year, and in 2005 (the last year I worked there) it was in April. The stores I've worked at have always been nervous about this time of the year. If you worked in retail, I'm sure you've felt the same. The new year is here! We've got three Friday the 13ths this year. Yes, three, in February, March and November. The Fourth of July and Halloween both occur on Saturdays this year. This hasn't happened since 1998. Only 19 more days until our new president takes office and more than a month till Digital TV takes over the airwaves. And who knows what else we have in store for the new year. We'll have to see where it takes each of us.